Before Christmas we managed one more work day on the greenhouse shed. It was the last work day since the recent temperatures have been unbearably cold for working. It's not predicted to be above freezing at all in the forecast. Snow is even being mentioned but I'll believe it when I see it! We managed to haul in 6000 lbs. of crushed gravel as base for the greenhouse flooring. Eventually I hope to use salvaged brick or paving stones on top of the gravel for the floor. The floor needs to be porous for water to flow through but still good for feet. We also managed to close up a gap in between the front two French doors. Once the doors were hung there was a 3/4 inch gap between them. We measured perfectly for the opening but had to remove some pieces from the door to make them work. OK I guess that really means we didn't measure perfectly - or at least we didn't take the extra pieces in account. Whatever the case we replaced the parts we took off with some wood pieces that really work great and close in the gap snugly. 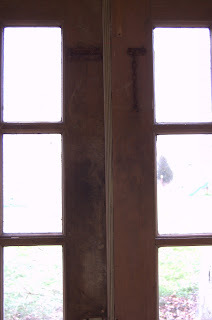 On the outside of the front doors we put some old molding that came from our house's back door. 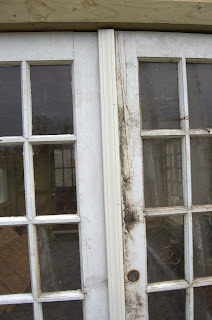 We had a new patio door replaced and saved the old trim molding just in case we could use it. It's nailed to the door on the right which opens outward. We'll eventually paint it to match the doors. On the inside we attached a strip of wood to the other door. It completely closes in the gap from the inside and gives the door knob something to lock into. I'm planning on painting the inside of the door eventually but that is very low on the priority list! Now if the cold would relent for a day or two and go back into the 40's I might actually be able to get more work done! This cold has really put a damper on things going on outside. Hubby got me a small greenhouse for Christmas and I'm anxious to get it started too. Can't wait for garden season! You are doing such a good job! What kind of GH did he get? Sounds exciting! I actually started some heuchera seeds this weekend. I'm thinking of getting a head start on some daylily seeds. They will have to remain inside for a while but maybe I'll be able to transfer them to the greenhouse...if the weather warms for me to finish! I know you must have great dreams for your greenhouse. You will soon be able to work on it again. Keep at the DIY Dave, though I know it's nigh on impossible in severe cold. It won't be long 'til the greenhouse sees some action. You've made such wonderful progress, Dave! It won't be long until your greenhouse will be positively steamy!